Next door access to food, fun and work! 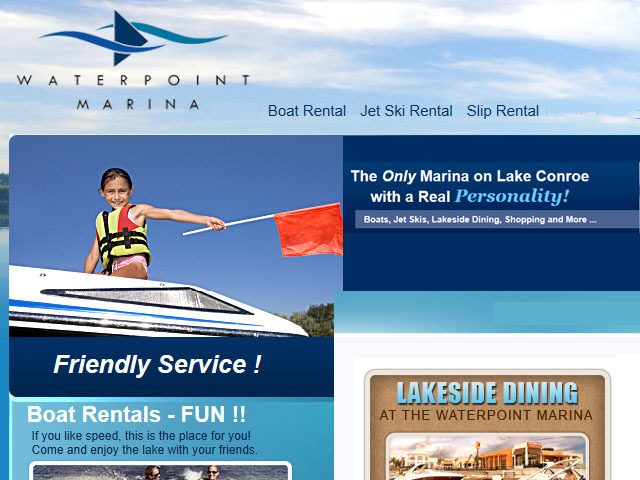 Waterpoint Marina is located in the Waterpoint Center on Highway 105 on the southern shores of Lake Conroe. This new 17-acre area offers an unprecedented blend of boutique shopping, waterfront restaurants, fish feeding pier and condominiums. Stroll along the waterfront Boardwalk and enjoy Starbucks Coffee, Marble Slab Ice Cream, CVS, Sam’s Boat Restaurant, Double Dave’s Pizza, Fajita Jack’s and more. Yacht charters, party barges, houseboat rentals, and slip rentals. We do not rent small boats and jet skis. Resort Attractions is headquartered at the Seven Coves Resort/Marina on Lake Conroe, a mere 35 miles north of Houston, Texas.